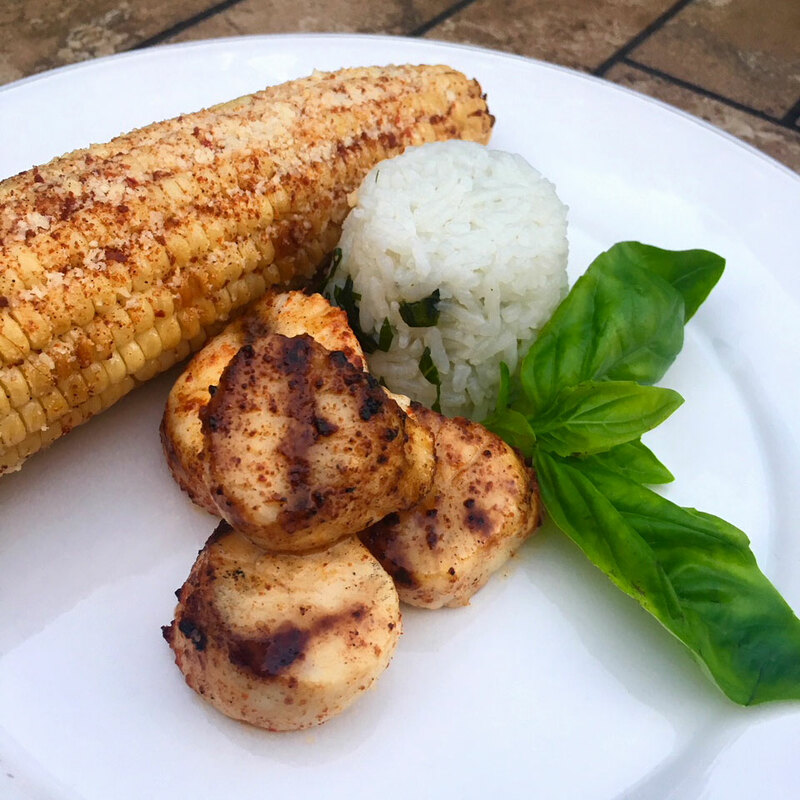 Grilled Scallops with Mexican Street Corn & Steamed Coconut-Basil Rice — The Local Catch, Inc. - The Best Rhode Island Seafood! As summer comes to a close, this will be the last Newport Cooks recipe for a while. Many thanks to Deja and Mary for sharing their delicious recipes with us! Preheat Grill to medium. Dry scallops and season with chile-lime seasoning and sea salt. Grill scallops until cooked through, flipping half way through to mark each side, approx. 5 minutes. Shuck corn and place ear in foil. Season with chile-lime seasoning, salt and pepper and butter. Wrap in foil to fully enclose and grill until cooked through, turning occasionally, approx. 15-20 minutes. Add more butter and sprinkle with parmesan before serving. Place rice in a medium pot. Rinse several times or until water becomes clear. Add coconut milk, basil sprig and salt. Fill pot with enough water to cover rice completely, plus an additional 1⁄2 inch above top. Place pot over high heat and bring to a boil then immediately reduce to a low simmer. Stir and cover with lid. Steam for approx. 15-20 minutes or until rice has absorbed all of the liquid. Remove from heat and fluff gently with a fork.